An amnesiac soldier, seeking his lost love, arrives in Archangel in northern Russia to help the townsfolk in their fight against the Bolsheviks, all quite unaware that the Great War ended three months ago. A ballet rendition of Bram Stoker's "Dracula", stylized as an Expressionistic silent film. Fact, fantasy and memory are woven seamlessly together in this portrait of film-maker Guy Maddin's home town of Winnipeg, Manitoba. A scientist chooses a wealthy man over her two lovers but must heal the earth's core to save humanity. Returned home to his long-estranged mother upon a request from her deathbed, a man raised by his parents in an orphanage has to confront the childhood memories that have long haunted him. Pieces of film are randomly composited together via computer to create unique short films that can be seen once and never again. It all happened in a Gimli we no longer know. Amma: It all happened in a Gimli we no longer know. Truly surreal and grotesque film. Guy Maddin is a truly unusual filmmaker.His movies are black comedic and supremely bizarre excursions into silent black-and-white cinema. 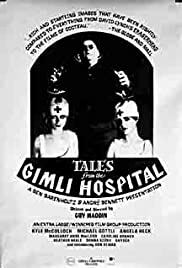 "Tales from the Gimli Hospital" is possibly his most famous and creepiest work to date.This is a wonderfully strange and puzzling movie filled with haunting and disturbing imagery.The action takes place in the small fishing town of Gimli,Manitoba, in some indeterminate time in the early part of the 20th Century.Einar and Gunnar,two men afflicted with the deadly smallpox virus,are housed in the small Gimli Hospital,their bodies covered with the scars of disease,their minds slowly slipping into paranoia and fear.Much of the film is silent,only archaic soundtrack is used regularly.The film is shot in equisite black-and-white and looks terrific.Give it a look,if you enjoy watching surrealist cinema.8 out of 10.